Distinctive Pet Wear for Discriminating Dogs! Welcome to our online Dog Boutique. If you've been to Key West, you've seen our cart at the corner of Duval and Eaton Streets, or at the infamous Sunset Celebration at Mallory Square. We take pride in offering you quality, comfortable dog collars, dog harnesses, dog leashes, dog bandanas, dog visors, dog dresses and dog shirts. 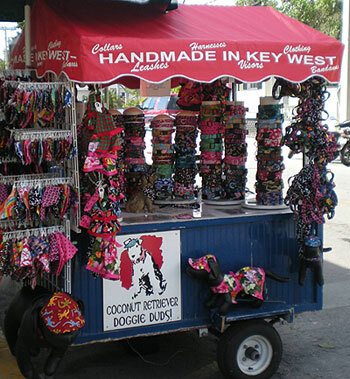 We hand make all of our products right here in Key West, Florida. Order today for your favorite Coconut Retriever.